RBC | Emergency crews responded to an accident about a mile and a half north of Hwy. 64 on County Road 7 Monday after a propane truck went off the road and the 11,500 gallon tank detached from the truck bed and rolled at least once, releasing the pop-off valve and causing a propane leak. The truck remained on its wheels and the driver was uninjured. Officials established a half-mile evacuation zone and determined two houses in the zone were unoccupied at the time. County Road 7 remained closed from 2:30 p.m. Monday to 1 a.m. Tuesday while recovery was underway. The sheriff’s deputies and county emergency manager transported children who live in the area to their homes after school. 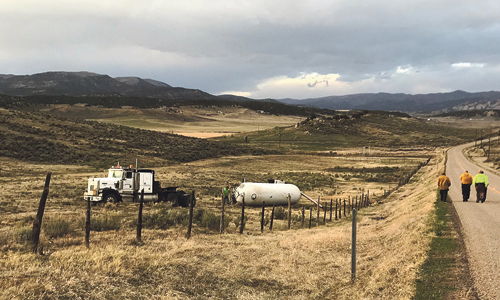 Meeker Fire and Rescue, Rio Blanco County Sheriff’s Deputies, Colorado State Patrol Road Patrol and Hazmat, Rio Blanco County Road and Bridge and Rio Blanco County Emergency Management responded. The tanker accident came right on the heels of a brush fire on the other side of Hwy. 64 during extremely windy conditions. Conditions are very dry, and Meeker Fire and Rescue asks residents, including ranchers preparing to burn ditches, to be extremely cautious, watch the weather and notify Rio Blanco Dispatch at 970-878-9620 before they start burning. RANGELY I A tragic accident claimed the life of a 17-month-old Rangely toddler late Sunday afternoon. RBC — A passenger was killed in a one-vehicle accident Dec. 17 on Highway 64, between Rangely and Dinosaur.